Prim and Propah: OM: Regain that Composure, Girl! After the horrific shooting of Arizona Rep. Gabrielle Giffords and the shooting death of U.S. District Judge John Roll among 5 others, I just have not been sitting right this week. Even though I don't know any of the victims personally or live anywhere near AZ, I just feel helpless for them, for me, for everyone. My thoughts and prayers have gone out to those suffering because of this violence. This post was pre-scheduled for my "One Moment" this week because on Friday, I will be laying in a hospital bed, God willing, recovering from a surgery undergone on Thursday. My family has been worrying about my surgery, obviously, because anytime you go to the hospital there is reason to worry, even if the issue seems small. My upcoming surgery and these shootings combined together have made me a nervous wreck this week, something I try to stay away from. I usually try to be happy/perky/positive but the hand I am playing as I write this, makes me want to fold. You never know how something will affect you. I didn't know who Gabrielle Giffords was before this week. Maybe it's because she looks like a nice lady and she is married to an astronaut. Maybe it's because I am majorly pre-menstrual and therefore extremely sensitive right about now. Maybe it's because I am going to be on medical leave in a week's time and have a zillion things to wrap up before I'm gone when I should be more worried about the actual surgery... I don't know. I don't know why this act of violence has really rocked me to the core, when others might not have. I just know it has. The pizazz cannot be mustered like usual. My "One Moment" this week is just, plain and simple, the fact that I realized that I cannot be super happy and chipper every moment of the day... I cannot even pretend to. Really and honestly, it is just not humanly possible... and that's OK. It's life, kiddies and "Life ain't fair". Life hands everyone some low blows but we have just got to pick ourselves up, dust ourselves off and regain that composure. As soon as I am out of the hospital (scheduled for Saturday), I am going to work on recovering both physically and mentally. It's been a doozy and I want to be chipper again! Letting go of the need to be happy all the time gives you freedom. I hope things go well for you today and good luck with your recovery! Good luck with your surgery and recovery. I hope you are well. I hope your recovery is swift and peaceful! 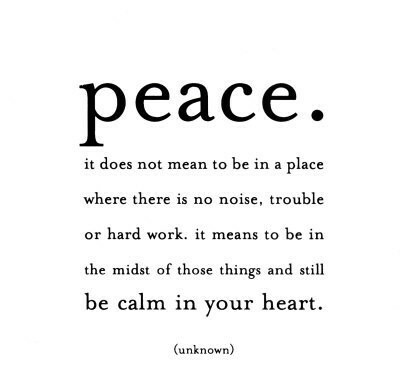 Peace in your heart is a much more realistic and mature goal than perpetual happiness. We all need to engage in the experience of life: the good and the bad. If we cannot feel our tragedies, we cannot celebrate our joys. Hope you are recovering well, comfortably, and quickly. 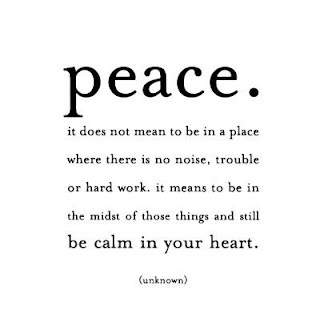 I love the Peace quote. We are complex people with complex lives. Embracing what makes us human is necessary to our growing and becoming better people. Fantastic OM! Thanks for sharing and be well! may need to borrow cash. south korea or elsewhere in asia. service is the foremost bet for individuals.